Cleaning tile floors by hand is hard work. It’s messy, uncomfortable—and impossible to get the deep-clean results that come with professional tile and grout cleaning. That’s because grout, which is a porous material, collects dirt, grime and spills, often discoloring the surface. Regular mopping and spot cleaning don’t reach the hidden dirt that lies deep within the pores of your grout lines. Our professional tile and grout cleaning service restores the luster to your floors, making them look like new. Neutral Cleaner For Floors: Floor Shine is a neutral cleaner for the maintenance of any kind of floor made of marble, granite, ceramic, etc. Its neutral pH formulation allows a general use on every washable surface. Floor Shine contributes in increasing the resistance of the treatment to pedestrian traffic. Dilute 100 ml of Floor shine in 1 liters of water. Buff the floor with mop or cloth. Do not rinse. 1 liter of FLOOR SHINE cleans about 10 square meter floor. Stored in a dry place in the original container. 12-24 months in original sealed packing kept in cool and dry place. In case material is released or spilled, clean up the most of the product. Absorb all residues with sand, sawdust etc. Store the residue in a plastic tank and call for a specialized company. 500 ml, 1 liter, 5 liter and 20 liter containers. Packaging Size (litre) 500ml, 1 Ltrs., 5 Ltrs. Dubond's Acid Cleaner for tile and stone is an inhibited heavy duty acid cleaner especially recommended to rapidly remove cement residues, salt peter, grout, tempera and lime scale on ceramic tiles, cotto, terracotta tiles, aged marble, porcelain stoneware etc. Dilute the product 1:1 to 1:10 in cold water, pour the solution on the floor and scrub manually with abrasive pad or floor machine with brown pad. Let it stand 5-10 minutes and continue scrubbing manually with abrasive pad or floor machine with brawn pad. Remove the residue liquid with clothes or possibly with wet vacuum and rinse with plenty of water. Let it dry. Quantity Per Pack 5 Ltrs. 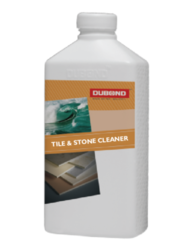 Dubond’s Tile & Stone Cleaner is an inhibited heavy duty acid cleaner especially recommended to rapidly remove cement residues, salt peter, grout, tempera and lime scale on ceramic tiles, cotta, terracotta tiles, aged marbles, porcelain stoneware, etc. 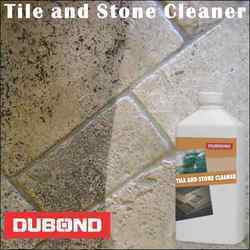 Dubond's Tile & Stone Cleaner is an inhibited heavy duty acid cleaner especially recommended to rapidly remove cement residues, salt peter, grout, tempera and lime scale on ceramic tiles, cotta, terracotta tiles, aged marbles, porcelain stoneware, etc. Packaging Details: 500ml, 1litre, 5litres & 20litres containers. 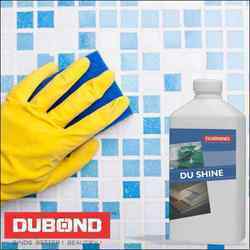 DU SHINE is Specially formulated detergent for cleaning DUBOND'S DUPOXY epoxy grout residue. DU SHINE Does not develop toxic or aggressive vapours. DU SHINE Cleans thoroughly without damaging the natural finish of floor. 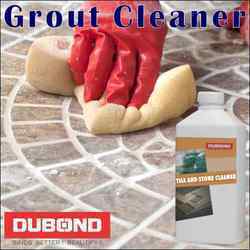 Cleans gaps grouted with DUBOND'S DUPOXY without damage. It is advisable to perform a preliminary test on tiles that are not to be laid, or in a concealed area. Apply DU Shine evenly to the surface to be cleaned and leave it until the dirt to be removed begins to visibly lift; this may take a few minutes or upto 10-20 minutes depending on the degree of absorption of the substrate. If necessary, scrape the surface mechanically with abrasive felt pads. in the case of large surface areas, a mechanical buffer with an abrasive felt pad is recommended. Repeat for highly stubborn dirt. Once cleaned rinse well and dry carefully. Do not use on porous surfaces. When using Du Shine near porous materials, protect them carefully against all risk of contact with Du Shine, even dilute solutions. Always test the action of Du Shine on any porous surfaces. Packaging Details: 500ml, 5 Ltrs.